Metastasis is the primary cause of death for cancer patients. TWIST1, an evolutionarily conserved basic helix-loop-helix (bHLH) transcription factor, is a strong promoter of metastatic spread and its expression is elevated in many advanced human carcinomas. However, the molecular events triggered by TWIST1 to motivate dissemination of cancer cells are largely unknown. Here we show that TWIST1 induces the production of interleukin 8 (IL8), which activates matrix metalloproteinases and promotes invasion of breast epithelial and cancer cells. In this novel mechanism, TWIST1-mediated IL8 transcription is induced through the TWIST1 carboxy-terminal WR (Trp-Arg) domain instead of the classic DNA binding bHLH domain. Co-immunoprecipitation analyses revealed that the WR domain mediates the formation of a protein complex comprised of TWIST1 and the nuclear factor-kappaB (NF-κB) subunit RELA (p65/NF-κB3), which synergistically activates the transcriptional activity of NF-κB. This activation leads to increased DNA binding affinity of RELA to the IL8 promoter and thus induces the expression of the cytokine. Blockage of IL8 signaling by IL8 neutralizing antibodies or receptor inhibition reduced the invasiveness of both breast epithelial and cancer cells, indicating that TWIST1 induces autonomous cell invasion by establishing an IL8 antocrine loop. Our data demonstrate that the TWIST1 WR domain plays a critical role in TWIST1-induced IL8 expression through interactions with and activation of NF-κB. The produced IL8 signals through an autocrine loop and promotes extracellular matrix degradation to enable cell invasion across the basement membrane. While treatment of the primary breast tumor is often well managed with surgery and radiation, metastatic spread to the brain, bones, liver and lungs frequently places women in an incurable state of disease . The basic helix-loop-helix (bHLH) transcription factor TWIST1 was previously demonstrated to be a potent promoter of cancer cell dissemination into circulation and metastasis [2–7], providing an ideal target for investigation and a promising therapeutic target for intervention. Based on its role in mesodermal development during mammalian embryogenesis [8, 9], TWIST1 is proposed to induce an embryonic event termed epithelial-mesenchymal transition (EMT) in tumor cells to promote the expression of mesenchymal junction proteins in epithelial cells and reduce intercellular junctions in the meantime [2, 10, 11]. Induction of EMT enables epithelial cells to acquire the properties of mesenchymal lineages, including enhanced mobility and invasiveness that are tightly correlated with cancer metastasis [12, 13]. Additionally, TWIST1 was shown to regulate the expression of AKT2  and miRNA-10b , which are subsequently involved in the migratory and invasive properties of TWIST1-overexpressing cells. Eckert et al. recently reported that TWIST1 up-regulates the expression of platelet derived growth factor receptor, which in turn promotes the formation of invadopodia and matrix degradation , presenting the first evidence that TWIST1 causes extracellular matrix (ECM) remodeling. However, the mechanisms by which TWIST1 actively promote cell invasion are still largely unstudied. TWIST1 is a class II member of the bHLH super family . It homo- or heterodimerizes with class I HLH family members, such as E proteins (E12/E47), through the HLH domain, and binds DNA that contains the E-box sequence (CANNTG) via the basic domain to regulate gene expression . Loss of function mutations in the bHLH domain in one allele of the TWIST1 gene cause Saethre-Chotzen Syndrome (SCS) in humans, an autosomal dominant craniofacial disease caused by gene haploinsufficiency [18–20], denoting the functional importance of the TWIST1 bHLH domain. TWIST1 also contains a highly conserved carboxy-terminus (C-terminus), the WR (Trp-Arg) domain (comprising the last 20 amino acid residues of TWIST1), which shares 100% sequence homology among jellyfish, Xenopus, mice and humans . This region was shown to mediate the association between TWIST1 and Runx2, a zinc-finger protein, and prevent Runx2 from inducing premature osteoblast differentiation during bone development in mice . However, whether the highly conserved WR domain plays any roles in TWIST1-induced cancer metastasis is an open question. Here we describe a unique property of the TWIST1 WR domain in mediating IL8 production and breast cancer cell invasion. Using Gene Set Enrichment Analysis (GSEA) of genetic profiles and cytokine array analyses, we found that IL8 was specifically up-regulated by TWIST1 over-expression in the human breast epithelial cell line MCF10A as well as other breast cancer cell lines. We also discovered that TWIST1 activates the IL8 promoter, but, surprisingly, in a manner that is independent of its canonical DNA binding bHLH domain. In contrast, TWIST1-induced IL8 promoter activation is dependent on the C-terminal WR domain, through which TWIST1 interacts with the NF-κB subunit RELA. This physical association of TWIST1 and RELA activated and synergized the transcriptional activity of NF-κB and increased the binding affinity of RELA to DNA, which in turn stimulated IL8 expression. Finally, we demonstrate that the IL8 autocrine pathway in breast epithelial and cancer cells increases matrix metalloproteinase (MMP) production and enables autonomous invasion of the cells. To elucidate the molecular function of TWIST1 in human breast epithelial cells, we compared the gene expression profiles of a TWIST1 over-expressing mammary epithelial cell line (MCF10ATw) and the parental line from which it was derived (MCF10A). We analyzed these data by GSEA (2.07) using the C2 canonical pathway gene sets  on paired independent experiments performed in triplicate using these cell lines. The returned gene set permutation test showed a significant difference in the BioCarta_Cytokine_Pathway between MCF10A and MCF10ATw cells at a false discovery rate of 0.012 (Additional file 1, Figure S1A and D). The gene set included the pro-inflammatory cytokine interleukin 1 alpha (IL1α) and the leukocyte chemokine IL8 as two significant contributors to the BioCarta_Cytokine_Pathway enrichment, with respective ranks of 3 and 11 as determined by signal-to-noise metric among all genes on the gene array, and in concordance with TWIST1 expression (Additional file 1, Figure S1B, D). To verify the up-regulation of these genes, we performed a cytokine array blot with conditioned media collected from MCF10A or MCF10ATw cell cultures. In this experiment, IL8, along with growth related oncogene (GRO) and angiogenin (ANG), showed the most pronounced up-regulation in MCF10ATw cells; however, secreted IL1α was not detected (Figure 1A, Additional file 2, Table S1). Quantification of IL8 revealed 34-fold greater mRNA expression and 3-fold greater secretion of IL8 protein into culture media of MCF10ATw relative to MCF10A cells (Additional file 1, Figure S1C). To test if IL8 was selectively up-regulated in the MCF10ATw stable cell line, we transiently transduced MCF10A parental cells with adenoviruses that expressed TWIST1 at serial dilutions and observed that IL8 transcripts were up-regulated in a dose dependent manner that correlated with the levels of TWIST1 expressed (Figure 1B). Since IL8 was up-regulated at both the mRNA and protein levels, indicating that IL8 is a downstream target of TWIST1, we, therefore, focused on elucidating the regulatory pathway of IL8. TWIST1 induces IL8 Production. (A) Cytokine array blotted with conditioned media collected from MCF10A or MCF10ATw cell cultures. Cytokines detected in MCF10ATw conditioned medium are shaded in Additional File 2, Table S1. POS, positive controls. (B) Relative mRNA levels of TWIST1 and IL8 normalized to β-ACTIN See Methods) in MCF10A cells 48 h post-transduction with adenoviruses that express TWIST1 (Ad.TWIST) at a serial multiplicity of infection (MOI). Cells transduced with Ad.EGFP (enhanced green fluorescent protein) at an MOI of 10 were used as controls. (C) Relative mRNA levels of TWIST1 and IL8 normalized to β-ACTIN as in (B) in SKBR3 and MCF7 cells 48 h post-transduction with Ad.TWIST as compared to Ad.EGFP (control). MOI = 5. (D) Relative mRNA levels of IL8, normalized as in (B), in BT549 cells with TWIST1 KD (right). Cells were transduced with lentiviruses that expressed a non-targeting shRNA (shCtrl) or shRNAs that targeted TWIST1 (shTw1, shTw2). Western blot (left) shows the levels of TWIST1 under these conditions. One and four minute exposures of the blot are shown. RELA is shown as a KD control. The data are from single representative quantification or images of at least three independent experiments. To evaluate the induction of IL8 by TWIST1 under pathological conditions, we expressed TWIST1 in the SKBR3 (epidermal growth factor receptor 2 positive, ERBB2/HER2+) and MCF7 (estrogen receptor positive, ER+) cell lines, which represent two different subtypes of breast cancer, and observed respective 20-fold and 4-fold increases in IL8 transcript levels (Figure 1C). The difference in IL8 transcript levels between these two cell lines may be due to the influence of ERBB2 expression on NF-κB transcriptional activity . In addition, short hairpin RNA (shRNA)-mediated knock-down (KD) of endogenous TWIST1 reduced the expression of IL8 mRNA in BT549 cells (Figure 1D), a triple-negative breast cancer cell line (progesterone receptor negative (PR-), ER- and HER2-) that expresses high endogenous levels of both TWIST1 and IL8. This reduction in IL8 expression correlated with the amount of TWIST1 protein knocked down (Figure 1D). Taken together, these data show that TWIST1 regulates and maintains IL8 expression in breast epithelial and cancer cells. To investigate whether TWIST1 activates IL8 transcription, we cloned the IL8 minimal promoter , which contains a putative TWIST1 binding site (an E-box sequence, CAGTTG) and a consensus κB response element, into a luciferase reporter construct (Figure 2A). SKBR3 and MCF7 cells transfected with this IL8 promoter construct displayed a consistent increase in luciferase activities when co-transfected with TWIST1, indicating transcriptional activation of IL8 (Figure 2B). Correspondingly, in BT549 cells, TWIST1 KD resulted in a decrease in IL8 promoter activity, and this activity was rescued upon exogenous TWIST1 expression (Figure 2C). TWIST1 induces IL8 promoter activity through the WR domain. (A) Illustration of the IL8 promoter proximity region. Boxed sequences are consensus binding sites of indicated transcription factors. Mutations (underlined) introduced into the NF-κB and TWIST1 binding sites (E-Box) to generate the ΔκB and ΔE-box promoter constructs (See Additional File 3, Figure S2A) are shown. Arrows indicate the positions of primers used for amplification of the IL8 promoter for ChIP assays (Figure5B-D). (B) Relative activities of IL8 promoter-driven luciferase in SKBR3 (middle) and MCF7 (right) cells. Cell lysates were collected 24 h post-transfection with TWIST1 wild-type (WT Tw) or S144R K145E, ΔWR or S144R K145E ΔWR mutant TWIST1 constructs (illustrated on the left) and dual luciferase assays were performed. n.s., not significant. (C) Relative luciferase activities of BT549 cells stably transduced with shCtrl or shTw for TWIST1 KD, with or without the expression of exogenous TWIST1. The data are from single representative experiments. Mean ± SD, n = 3, ** P ≤ 0.01. To further clarify whether TWIST1 directly binds and activates the IL8 promoter, we transfected SKBR3 and MCF7 cells with an IL8 promoter construct that was mutated at the putative TWIST1 binding E-box (Figure 2A, ΔE-box, CA:GT). In this experiment, TWIST1 failed to stimulate luciferase transcription (Additional file 3, Figure S3A), indicating that integrity of the E-box sequence is required for IL8 promoter activation. However, we were concerned that these mutations may affect the binding of C/EBP, a known regulator of IL8 because the E-box sequence heavily overlaps with the C/EBP binding site . Therefore, we generated two DNA binding deficient TWIST1 mutants by introducing the S144R/K145E and R118C mutations (Figure 2B and S2B). These naturally occurring mutations found in SCS patients abolish the DNA binding ability of TWIST1/E12 heterodimers without affecting its subcellular localization . Surprisingly, both the S144R/K145E (Figure 2B) and R118C (Additional file 3, Figure S2B) TWIST1 mutants stimulated the IL8 promoter at similar levels as wild type (WT) TWIST1 in SKBR3 and MCF7 cells (Figure 2B and Additional file 3, Figure S2B). To further validate that the DNA binding ability of TWIST1 is not required for IL8 promoter activation, we completely removed the bHLH domain of TWIST1 (ΔbHLH) and still observed IL8 promoter activity induced by this mutant comparable to that of wild type TWIST1 in MCF7 cells (Additional file 3, Figure S2B). More importantly, when we performed chromatin immunoprecipitation (ChIP) assays with solubilized chromatin collected from MCF10A cells transfected with S144R/K145E DNA-binding deficient TWIST1 mutant, we did not detect any statistically significant enrichment of mutant TWIST1 capable of activating IL8 expression on the IL8 promoter (See later results, demonstrating that the activation of IL8 promoter is independent of DNA binding activity of TWIST1. To better understand which region of the TWIST1 protein is responsible for IL8 promoter activation, we decided to remove the last 20 amino acids at the C-terminal end of TWIST1, which comprise its highly conserved WR domain (ΔWR), and transfected this ΔWR mutant protein into SKBR3 and MCF7 cells. Intriguingly, unlike the DNA binding deficient TWIST1 mutants, the ΔWR truncation mutant protein completely lost its ability to activate the IL8 promoter. Furthermore, combining the S144R/K145E mutations with the WR deletion showed similar activation of the IL8 promoter as compared to ΔWR alone (Figure 2B), illustrating that the WR domain is essential for TWIST1-induced IL8 expression. It was reported by Sosic et al. that TWIST1 and 2 regulate the transcriptional activity of NF-κB in mice and specifically TWIST2 does so through its C-terminal region, which contains a WR domain . Given that NF-κB is a central regulator of IL8  and that the WR domain is highly conserved between TWIST1 and TWIST2, we hypothesized that NF-κB is involved in TWIST1-mediated IL8 promoter activation. To address this hypothesis, we made use of a dominant negative (DN) form of IκBα (S32A S36A super repressor, IκBSR) that constitutively suppresses the activation of NF-κB , and found that TWIST1 could no longer activate the IL8 promoter when co-transfected with this suppressor in both SKBR3 and MCF7 cells (Figure 3A). To determine if this was due to the inference of IκBSR on the expression or activity of TWIST1, we examined the expression of TWIST1 in the nuclei of cells co-transfected with IκBSR, and in fact found greater amounts of TWIST1 protein in the nuclear fractions of these cells than cells transfected with TWIST1 alone (Additional file 3, Figure S2C). Additionally, in BT549 cells, which express high endogenous levels of TWIST1, transfection of IκBSR showed attenuated IL8 promoter activity, which was completely abolished by mutations in the κB consensus site that disrupts binding of NF-κB to the IL8 promoter  (Figure 2A underlined ΔκB, 3B), indicating that NF-κB transcriptional activity is crucial in the expression regulation of IL8 in these cells. NF-κB mediates TWIST1- induced IL8 promoter activation. (A) IL8 promoter-driven relative luciferase activities of SKBR3 (left) and MCF7 (right) cells 24 h after transfection with TWIST1 (Tw) and/or IκBSR. (B) Relative luciferase activities of BT549 cells 24 h post-transfection with the IL8 WT promoter with or without IκBSR, or ΔκB IL8 mutant promoter alone. (C) Relative luciferase activities of SKBR3 (left) and MCF7 (right) cells transfected with ΔκB or WT IL8 promoter in the presence or absence of TWIST1 and/or TNF stimulation (40 ng/ml). Data are from single representative experiments. Mean ± SD, n = 3, ** P ≤ 0.01. To compare the role of TWIST1 and tumor necrosis factor alpha (TNF-α), an activator of NF-κB, on IL8 promoter activation, we treated SKBR3 and MCF7 cells transfected with the IL8 promoter construct and DNA vector or TWIST1 with TNF-α. Although the IL8 promoter was activated to greater levels by TNF-α alone than by TWIST1 transfection in both cell lines, the expression of TWIST1 synergized the effect of TNF-α on IL8 promoter activation in both cell lines. Moreover, mutations in the κB consensus binding site eliminated this synergy, indicating that the synergistic effect of TWIST1 and NF-κB is dependent upon NF-κB/DNA binding (Figure 3C). The above data also suggest that TWIST1 activates the transcriptional activity of NF-κB, possibly through a mechanism upstream of IκBα, different from the canonical TNF-α pathway. To further understand the mechanism by which the activation and synergy of NF-κB occurs, we focused on the NF-κB subunit RELA, which is a conserved binding partner of TWIST1 [26, 28]. To address whether RELA is the NF-κB subunit that mediates TWIST1-induced IL8 expression, we performed shRNA-mediated KD of RELA in SKBR3 and MCF7 cells, and found that IL8 promoter-driven luciferase activity under TWIST1 over-expression was attenuated by RELA KD in both cell lines (Figure 4A). When we performed double KD of TWIST1 and RELA in BT549 cells, we observed a slight decrease of the IL8 promoter activity compared to TWIST1 KD (Additional file 3, Figure S2D), indicating that RELA alone is partially responsible for the basal expression of IL8. We also noticed that the KD of RELA in TWIST1 over-expressing cells was less efficient than in TWIST1-null or low expressing cells, suggesting that TWIST1 expression may stabilize RELA protein when its expression is reduced without affecting its overall basal expression levels (Figure 4A and Additional file 3, Figure S2E). Additionally, forced expression of TWIST1 in HEK293 cells, which do not express detectable levels of TWIST1 or RELA (Figure 4C and Additional file 3, Figure S2F), failed to stimulate IL8 promoter activity; whereas transfection of these cells with RELA activated the IL8 promoter, which was further synergized by the co-transfection with TWIST1 (Figure 4B). Furthermore, mutations in the κB consensus binding site abolished this synergistic effect between TWIST1 and RELA (Figure 4B), indicating that the association of NF-κB with DNA is necessary for IL8 transcriptional activation and synergism induction by TWIST1. TWIST1 interacts with RELA and induces NF-κB transcriptional activity through the TWIST1 WR domain. (A) IL8 promoter-driven relative luciferase activities of SKBR3 and MCF7 RELA KD cells transfected with or without TWIST1. Cells were transfected with control shRNA (shGFP) or shRNA against RELA (shRelA) 24 h before the transfection of IL8 promoter construct with TWIST1 or pcDNA (vector) control followed by luciferase activity measurement 24 h later. Western blots (below) show the representative KD levels of RELA in these cell lines. (B) Relative luciferase activities in HEK293 cells 24 h post-transfection with TWIST1 and/or RELA. WT, IL8 WT promoter; ΔκB, ΔκB IL8 mutant promoter (shown in Figure 2A). (C) Co-IP experiments with α-RELA antibodies or IgG control. Antibodies were incubated with lysates collected from HEK293 cells 24 h post-transfection with RELA and WT or mutant TWIST1. Cells that were not transfected or transfected with WT TWIST1 only were used as negative controls. ‡, presence of Myc-tag on the TWIST1 proteins. (D) Relative luciferase activities driven by 3x NF-κB response elements in SKBR3 cells 24 h post-transfection with indicated constructs or treated with TNF (40 ng/ml). 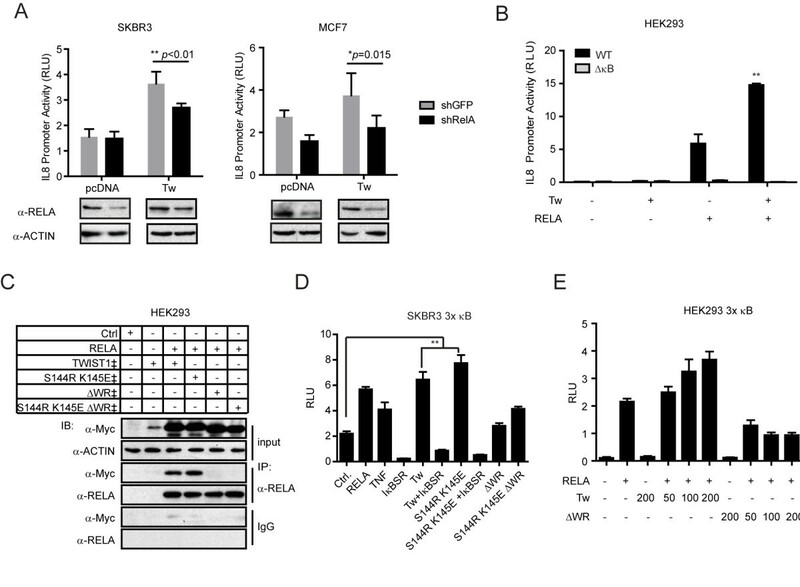 (E) Relative activities of luciferase driven by 3x NF-κB response elements in HEK293 cells 24 h post-transfection with RELA (50 ng) and WT or ΔWR TWIST1. The amounts of TWIST1 DNA constructs transfected are indicated below (ng). Total amount of DNA transfected was kept constant with sham vectors. (A), (B), (D) and (F) are from single representative experiments. Mean ± SD, n = 3, *P ≤ 0.05, ** P ≤ 0.01. The TWIST1 WR domain was previously shown to mediate the interaction between TWIST1 and non-bHLH protein partners, such as Runx2 . An association between recombinant murine TWIST1 and RELA was also previously reported . Therefore, we speculated that the TWIST1 WR domain bridges an interaction between human TWIST1 and RELA. To address this, we performed RELA co-immunoprecipitation (co-IP) experiments using HEK293 cells transfected with WT or mutant TWIST1 using α-RELA antibodies (Figure 4C). Consistent with earlier reports, WT human TWIST1 co-immunoprecipitated with RELA; and the TWIST1 bHLH mutant (S144R K145E) was also precipitated by α-RELA antibodies in HEK293 cells transfected with the TWIST1 mutant and RELA. However, neither the ΔWR nor S144R K145E ΔWR TWIST1 mutant could be detected by α-RELA antibodies in co-IP experiments when equal amounts of RELA were precipitated. Collectively, these results demonstrate that the TWIST1 WR domain is necessary for the association between RELA and TWIST1, and is crucial for transcriptional activation of TWIST1-induced IL8 expression. To determine if this interaction between RELA and TWIST1 regulates the activity of NF-κB, we used a luciferase construct driven by an artificial promoter that contains three repeats of the κB consensus sites (3x κB). In this experiment, both WT and S144R K145E TWIST1 stimulated the κB consensus site in SKBR3 cells, but this stimulation was completely blocked by IκBSR expression, indicating that the activation was mediated by the endogenous NF-κB (Figure 4D). 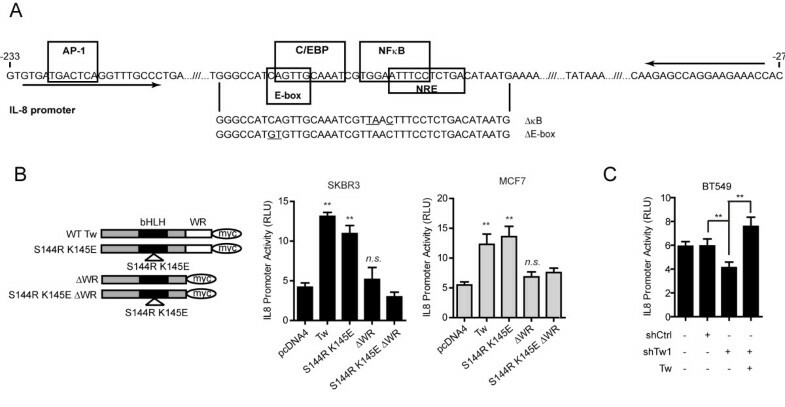 In contrast, neither the ΔWR nor S144R K145E ΔWR TWIST1 mutant could stimulate NF-κB transcriptional activity in a similar manner in luciferase assays (Figure 4D). Furthermore, the increase in NF-κB transcriptional activity was dependent upon the amount of TWIST1 being expressed (Figure 4E), whereas ΔWR TWIST1 in any given amount failed to activate NF-κB transcriptional activity in HEK293 cells transfected with the 3x κB luciferase construct (Figure 4E). These results demonstrate that the TWIST1 WR domain, which mediates the association between TWIST1 and RELA, is essential for the activation of NF-κB transcriptional activity and synergy. To confirm the physiologic relevance of the association between TWIST1 and RELA, we performed co-IP experiments with BT549 cells, which express endogenous TWIST1. Using α-TWIST1 antibodies, we found that RELA was exclusively pulled down with TWIST1 in the nuclear but not the cytosolic fraction of BT549 cells (Figure 5A), suggesting that TWIST1 and RELA form a protein complex in the nuclear compartment. TWIST1 enhances the association of RELA with the IL8 promoter. (A) Fractionation-coupled Co-IP experiments (upper panel) with BT549 cell lysates using α-TWIST1 antibodies or IgG control. Cyto or c, cytoplasmic; n, nuclear. (B) ChIP assays using α-TWIST1 antibodies with solublized chromatin collected from MCF10A cells transfected with pcDNA, wild type TWIST1, S144R K145E or DWR TWIST1 mutant for 48 h. (C) ChIP assays with MCF10A and MCF10ATw cell lysates (left), or lysates from BT549 cells transduced with shCtrl or shTw (right), using α-RELA antibodies and IgG control. (D) ChIP assays with BT549 cell lysates using α-TWIST1 (left) or α-RELA antibodies and IgG controls. Mean ± SD, n = 3. IL8p, IL8 promoter amplified with primers flanking the E-box and kB binding sites (Figure 2A); IL8pCtrl#2, IL8 promoter enhancer region amplified with primers 2 kb upstream of transcription initiation site (primer sequences see Methods). Next, to understand if the TWIST1/RELA protein complex is associated with the IL8 promoter sequence and whether this protein/DNA association is essential for promoter activation, we performed ChIP assays using α-TWIST1 antibodies with MCF10A cells transfected with WT TWIST1, S144R/K145E or ΔWR TWIST1 mutants (Figure 5B). We found that although the WT and the ΔWR TWIST1 mutant were associated with the IL8 promoter, the S144R/K145E DNA binding mutant is not presented at the same region, confirming that these point mutations indeed disrupt the DNA binding ability of the protein. More importantly, it demonstrates that the activation of RELA by TWIST1 can be achieved away from the IL8 promoter DNA and that the direct or indirect association of TWIST1 via RELA to the IL8 promoter is not required for IL8 transcription activation. In addition, we also observed that there is no difference in the enrichment of the IL8 promoter between WT TWIST1 and ΔWR-expressing cells indicating that the interaction between TWIST1 and RELA does not appear to affect the ability of TWIST1 to become associated with the IL8 promoter, presumably through the E-box sequence (Figure 5B, Additional file 3, Figure S2G). We further compared the association of RELA with the IL8 promoter between MCF10A and MCF10ATw cells and detected statistically enriched signals of RELA on the IL8 promoter in MCF10ATw relative to MCF10A cells (Figure 5C), which indicates that the binding affinity of RELA to the IL8 promoter is greatly enhanced in the presence of TWIST1. Reciprocally, the percentage of RELA-associated IL8 promoter was significantly reduced in BT549 cells when TWIST1 was KD (BT549.shTw1) compared to those transduced with non-targeting shRNA control (BT549.shCtrl) (Figure 5E, right). Together, these data demonstrate that TWIST1 increases the recruitment of RELA to the IL8 promoter. Under physiological conditions, IL8 activates endothelial cells and neutrophils to produce and release MMPs to enhance their migration and invasion in order to facilitate angiogenesis and extravasation, respectively [29, 30]. These observations suggest that IL8 produced by TWIST1-expressing breast cells may also alter their migratory and invasive potentials, features seen with many invasive cancer cells. To examine this possibility, we compared MCF10A and MCF10ATw cells and found that expression of TWIST1 significantly increased the migratory and invasive potential of MCF10A cells in transwell assays towards serum-rich media (Figure 6A, C). When MCF10ATw cells were treated with IL8 neutralizing antibodies or inhibitors against the IL8 receptors (SB225002, a CXCR2 receptor inhibitor , Repertaxin, a CXCR1 and CXCR2 inhibitor ), the number of invasive cells was reduced by 50%. Interestingly, no significant difference was seen in the number of migratory cells in response to IL8 signaling blockage (Figure 6A, C), indicating that TWIST1 mediates the production of IL8 to induce ECM degradation but not to enhance the cell's motility. To test whether blockage of the IL8 autocrine pathway affected cell division in the migration/invasion assays, we performed cell proliferation assays and found cell growth was not affected by the treatment of neutralizing antibodies or inhibitors (Figure 6B), verifying that the decrease in number of invaded cells was not a result of reduced proliferation. IL8 increases cellular invasive potentials. (A) Transwell migration (left) and invasion (right) assays of MCF10A and MCF10ATw cells towards 20% horse serum for 24 h. MCF10ATw cells were treated as indicated. α-IL8 Ab, IL8 neutralizing antibody, 10 μg/ml; SB225002, 10 nM; Repertaxin, 400 μM; n.s. not significant. Mean±SD, n = 3, *P ≤ 0.1, **P ≤ 0.05. (B) Proliferation assays for MCF10A, MCF10ATw and MCF10ATw cells cultured as indicated with conditions described in (A) for 24 h. Mean±SD, n = 3. (C) Representative images of cells from transwell migration and invasion experiments described in (A). Scale bar, 160 μm. (D) Gelatin zymography assays of conditioned media collected from MCF10A, MCF10ATw or MCF10ATw cell cultures treated with indicated compounds for 24 h. SB225002, 100 nM; Repertaxin, 400 nM. (E) Transwell invasion assays (left) of BT549 cells towards 20% fetal bovine serum for 24 h. Cells were stably transduced with control shRNAs (shCtrl1, shCtrl2), shRNA against IL8 (shIL8) or TWIST1 (shTw). Mean ± SD, n = 3, **P ≤ 0.05. Representative images (right) of BT549 cells that invaded through Matrigel. Scale bar, 160 μm. (F) Proliferation assays (24 h) for BT549 cells stably transduced with shCtrls, or shRNA against IL8 (shIL8) or TWIST1 (shTw) under conditions described in (E). Mean±SD, n = 3. Because IL8 autocrine signaling significantly altered the invasive properties of MCF10ATw cells, we analyzed the expression and activation levels of MMPs, which play important roles in ECM degradation. Using gelatin zymography, we found that the production and activation of MMP9 were greatly enhanced by TWIST1 over-expression in MCF10A cells. 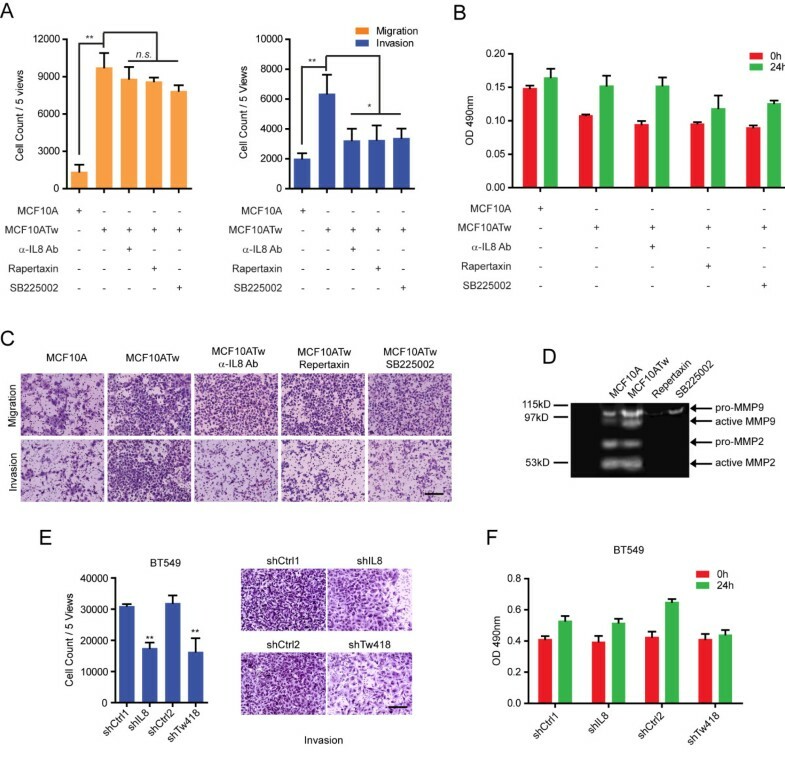 Addition of Repertaxin or SB2255002 to MCF10ATw cell cultures markedly reduced the expression and activation of both MMP2 and MMP9 to below detectable levels (Figure 6D). These results indicate that TWIST1 over-expression establishes an IL8 autocrine loop that regulates the production and activation of MMP2 and 9. To investigate whether IL8 also mediates cellular invasiveness in cancer cells, we performed shRNA-mediated KD of IL8 in BT549 cells, and found a 40% reduction in the number of invasive cells as compared to the non-targeting shRNA control. This reduction in the number of invasive cells as a result of IL8 KD was similar to that of the TWIST1 KD of BT549 cells in comparison to both non-targeting shRNA controls (Figure 6E). In addition, neither IL8 nor TWIST1 KD of BT549 cells displayed significant differences in their proliferation rates during the course of the invasion assay (Figure 6F). Collectively, these data demonstrate that TWIST1-induced IL8 production regulates the invasive properties of breast epithelial and cancer cells through an autocrine loop. We compared the expression of TWIST1 and IL8 in multiple breast cancer cell lines, which revealed that both TWIST1 and IL8 are expressed in the basal but not in the non-basal breast cancer cell lines (Figure 7A). Although the amounts of IL8 transcript did not appear to be proportional to the detected levels of TWIST1, which is likely due to the presence of other IL8 regulators in these cell lines, these results indicate an overall correlation between TWIST1 and IL8 expression in the aggressive basal subtype of human breast cancers. TWIST1 and IL8 expression is enriched in the basal subtype of human breast cancers. (A) Reverse-transcription PCR of indicated cell lines for TWIST1 and IL8 with β-ACTIN as control. (B) Relative mRNA levels of IL8 and TWIST1 of luminal A (LumA), ERBB2/HER2+ (ERBB2) and basal subtypes from STOCKHOLM human breast tumor dataset (total n = 159). Boxes represent the lower quartile, median and upper quartile; Whiskers represent the tenth and ninetieth percentiles; and dots represent outliers. P-values were calculated using Mann-Whitney U test. (C) Relative mRNA levels of IL8 and TWIST1 of LumA, ERBB2 and basal subtypes from UPPSALA human breast tumor dataset (total n = 253). Graphs were plotted and P-values calculated as described in (B). To determine the relevance of the in vitro mechanistic studies in relation to patient samples, we analyzed the relative expression levels of TWIST1 and IL8 in the STOCKHOLM (GSE1456) and UPPSALA (GSE3494) human breast tumor datasets (with a total of 412 samples from both datasets combined). These samples were divided into luminal A, luminal B, normal-like, ERBB2 and basal subtypes based on their molecular intrinsic signatures identified by Calza et al. (, personal communication with Dr. Pawitan). Results from these analyses demonstrate significantly higher levels of IL8 expression in the basal compared to the luminal A subtype in both datasets, which was also seen in the ERBB2 subtype in the UPPSALA dataset (Figure 7B, C). Moreover, although the overall differences in relative expression levels of TWIST1 were small across different subtypes, TWIST1 expression was significantly elevated in the basal as well as the ERBB2 subtypes in both datasets when compared to luminal A subtype (Figure 7B, C). More importantly, the co-expression of TWIST1 and IL8 is correlated in the basal and ERBB2 subtypes, the two most aggressive subtypes of human breast cancers , supporting the important roles of the transcription factor and the cytokine in the pathology of advanced breast cancers. Herein, we show that TWIST1 up-regulates IL8 expression to induce cell autonomous invasion through the conserved C-terminal WR domain. 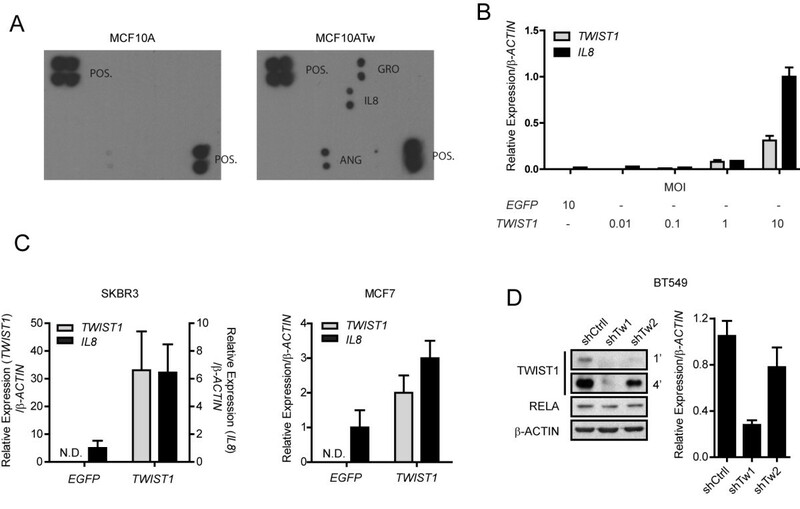 The WR domain mediates the association of TWIST1 and RELA, which is essential for TWIST1-induced stimulation and synergism of NF-κB transcriptional activity and IL8 production. Additionally, TWIST1 forms a protein complex with RELA and enhances the association of RELA with the IL8 promoter, thus inducing IL8 expression. Finally, TWIST1-mediated secretion of IL8 establishes an autocrine loop in breast cells to regulate MMP production and cell invasion. TWIST1 is commonly characterized by its bHLH domain, which is thought to be responsible for the transcriptionally regulated events controlled by this molecule [2, 10, 14–16]. However, the functional domains of TWIST1 have not been thoroughly studied and many questions are unanswered regarding their potential interacting partners, which in turn can be highly valuable for understanding the mechanism of cancer cell dissemination. Here we demonstrate that instead of direct IL8 gene activation, TWIST1 interacts with RELA, a non-HLH binding partner, and activates/synergizes transcriptional activity of NF-κB to up-regulate the NF-κB downstream gene target, IL8, which in turn regulates MMP production and cell invasion. This example indicates that TWIST1 can recruit non-HLH transcription factors to form protein complexes and modify gene expression downstream of this partner, which is supported by previous developmental and biochemical studies showing that TWIST1 can regulate the activity of its interacting co-factors [21, 34, 35]. RELA is a subunit of the NF-κB complex, which is a central mediator of inflammatory responses  and causes many pathophysiological conditions upon activation , including tumorigenesis and metastasis [38, 39]. Previous reports indicated that during normal mesodermal tissue development, TWIST1 and 2 inhibited the transcriptional activity of NF-κB and suppressed expression of the pro-inflammatory cytokines TNF-α and IL-1β . 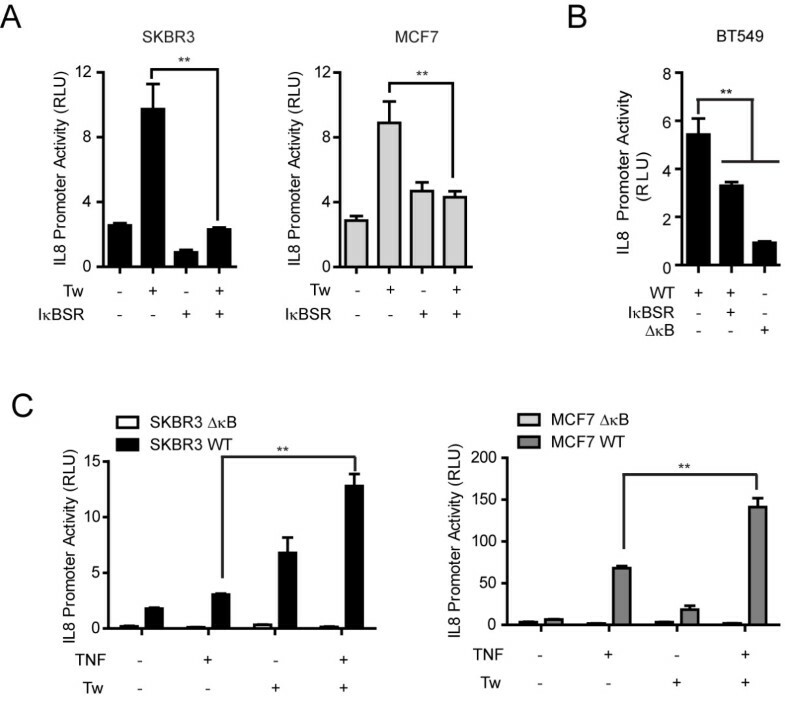 In contrast, our results show that in breast tumor cell lines, TWIST1 stimulates NF-κB through the TWIST1 WR domain and up-regulates the expression of the NF-κB downstream target gene IL8. These findings are in agreement with an earlier report indicating that TWIST1 synergizes the transcriptional activity of NF-κB in a manner that is independent of its bHLH domain . The seemingly contradicting data in normal mesodermal tissues and breast tumor cell lines may indicate there are additional players modifying the functional relationships between TWIST1 and RELA during different processes in development. We hypothesize that the potential regulatory mechanisms may involve the initial availability of additional co-factors in a given cell type as well as the transcription factor binding sites present on specific target promoters. As an example, during dorsal-ventral development in Drosophila embryos, the cell types along the lateral wall of the embryo are determined by the expression of genes [40, 41], which are differentially regulated by gradients of the morphogens Dorsal (orthologue of RELA) and Twist, as well as the proximity of the binding sites on promoters of these genes . Here, the selective induction of IL8 among many cytokines also argues for the importance of promoter organization as a critical factor that determines gene regulation by TWIST1 and NF-κB as in comparison to a non-cytokine NF-κB target gene, IκBα, whose promoter was not enriched with either TWIST1 or RELA in our ChIP assays (data not shown). Our data that TWIST1 activates RELA to induce IL8 expression suggest that in breast epithelial and cancer cells, the expression of TWIST1 can translate an extracellular signal, such as hypoxia, and signal intracellularly to modify the activity of endogenous RELA and induce IL8 expression specifically when there is no apparent extracellular signal for NF-κB activation. Furthermore, that TWIST1 can synergize the IL8 promoter activation induced by TNF-α indicates that TWIST1- and TNF-α-induced RELA/NF-κB activation contain overlapping yet non-identical biological effects. Finally, Pham et al. confirm Sosic et al. 's findings  that TWIST1 is a downstream target of RELA, yet they found that TWIST1 acts as a RELA effector protein to block programmed cell death mediated by TNF-α treatment, implying that the functional relationships between TWIST1 and TNF-α in NF-κB activation can depend on the genes being regulated and the physiological conditions of the specific cell type. Despite some discrepancies , IL8 expression was elevated in both invasive cancer cells [45, 46] and in the sera of patients with aggressive cancers [47, 48]. It is well known that IL8 induces potent neutrophil chemotaxis , which causes cytoskeletal reorganization, as well as release and activation of MMPs from neutrophils to induce directed migration of the granulocytes . Here we show that TWIST1-induced IL8 expression in breast epithelial cells up-regulates MMP production and enhances cellular invasive property without affecting migratory ability, suggesting that the biological effects of IL8 on motivating cytoskeleton remodeling are slightly different in cancer cells. This also implies that secreted IL8 primarily enhances the cellular ability to degrade basement membrane (laminin, the primary component of Matrigel), a phenomenon common in metastatic cancers. Blockage of IL8 signaling or knockdown of the cytokine with shRNAs against TWIST1 did not cause MCF10ATw (Figure 6C, top panel) or BT549 (Figure 6E, upper right) cells to lose their mesenchymal phenotype, indicating the reduced invasive properties resulted from IL8 signaling inhibition was not a result of reversion of EMT. This observation may be because of the fact that mesenchymal-epithelial transition is a lengthy process; however, immunoblots of epithelial and mesenchymal markers of BT549 cells stably transduced with shIL8 or shTw did not appear to be morphologically or biochemically different from the BT549.shCtrl cells (data not shown), suggesting the increased cellular invasiveness mediated by IL8 expression is independent of the EMT process. The fact that IL8 is a chemokine for neutrophils is another important element for tumorigenesis and the development of tumor microenvironment. Neutrophils are short-lived multinuclear white blood cells that have a profound role in ECM degradation and are responsible for several diseases characterized by severe damage of tissue structure [51–53]. The expression of IL8 by tumor cells can cause infiltration of neutrophils (tumor-associated neutrophils, TAN), which has been evident for many years . It was recently discovered that, like tumor-associated macrophages, TAN also displayed two phases of actions, switching from the anti-tumorigenic to the proto-tumorigenic stage , providing evidence of the involvement of neutrophils in cancer progression. Moreover, IL8 is a known effective pro-angiogenic factor  that promotes endothelial cell survival and MMP production critical for vascularization . This characteristic of IL8 may partially be responsible for TWIST1-associated tumor angiogenesis that was previously noted by our group and collaborators in TWIST1 over-expressing MCF7 breast tumor cells . Overall, increase of basal expression of IL8 can bring forth its pleiotropic effects in affecting tumor progression, remodeling of the tumor microenvironment and the formation of cancer metastasis. Our study demonstrates that the TWIST1 WR domain is functionally critical to TWIST1-induced cell invasion. This domain is essential for the interaction between TWIST1 and the NF-κB subunit RELA, which is key to IL8 induction. TWIST1-mediated up-regulation of IL8 leads to MMP production and ECM degradation, resulting in enhanced cell-autonomous invasion. The MCF10ATw cell line was generated by stable transfection  of pcDNA3-TWIST  into MCF10A cells (an immortalized normal human breast epithelial cell line, American Type Culture Collection, ATCC, Manassas, VA, USA). MCF10ATw and MCF10A cells were cultured as previously described . HEK293, SKBR3, MCF7 and BT549 cell lines were purchased from ATCC and cultured using ATCC's recommended protocols and authentication methods. All cells were maintained at 37°C, 5% CO2, 90% humidity in a tissue culture (TC) incubator. Transfections were performed using Lipofectamine 2000 (Invitrogen, Carlsbad, CA, USA) according to the manufacturer's instructions. Triplicate samples of MCF10A and MCF10ATw cells were used for expression profiling with the Affymetrix Human Genome U133 Plus 2.0 array, and data collection was performed in the Microarray Core Facility at City of Hope. RNA was extracted using TRIzol reagent (Invitrogen) and analyzed for integrity using an Agilent Bioanalyzer 2100 (Agilent Technologies, Wilmington, DE, USA). Double stranded cDNA was reverse transcribed using total RNA (5 μg), the GeneChip® Expression 3'-Amplification Reagents One-Cycle cDNA Synthesis Kit (Affymetrix, Santa Clara, CA, USA) and oligo-dT primers containing a T7 RNA polymerase promoter. A 1:10 dilution of Poly-A controls (2 μl) was added as an internal control for the synthesis. Double-stranded cDNA was used as a template to generate biotinylated cRNA using the GeneChip® Expression 3'-Amplification Reagents for in vitro transcription labeling (Affymetrix). Biotin-labeled cRNA was fragmented following the Affymetrix protocol. Hybridization cocktails contained 15 μg fragmented cRNA, 5 μl 3 nM control oligonucleotide B2, 15 μl 20X eukaryotic hybridization controls, BSA (0.5 mg/ml), herring sperm DNA (0.1 mg/ml), dimethyl sulfoxide (DMSO) (10%), and hybridization buffer for a final volume of 300 μl. Hybridization cocktails (200 μl) were hybridized (45°C, 16 h) to HG U133 Plus 2.0 Affymetrix arrays in an Affymetrix GeneChip Hybridization Oven 640. GeneChip arrays were washed with wash buffer (Affymetrix, santa Clara, CA, USA) and stained with streptavidin-phycoerythrin on an Affymetrix Fluidics Station 450, followed by scanning on an Affymetrix GeneArray 3000 scanner. Data were extracted using GeneChip Operating Software (version 1.4) (Affymetrix, Santa Clara, CA USA). Analysis of microarray data was performed using Partek Genomics Suite 6.4 (Partek, Inc., St. Louis, MO, USA) as follows. The Robust Multi-array Average (RMA) algorithm was adapted to normalize and summarize the intensities of probes into gene-level expression. A two-way ANOVA model was used with TWIST over-expression and scan dates as factors to identify the effect contributed mainly by TWIST. Only genes with P-value < 0.05 and |fold change| >2 were considered significantly differentially expressed. Genes were further analyzed using Gene Set enrichment Analysis (GSEA) to provide gene enrichment analysis and functional interpretation. A cytokine heat map was generated based on cytokine-related gene sets available from GSEA. Conditioned media from cell cultures with equal numbers of seeded cells (8 × 105, six-well plate) cultured for 24 h were collected for ELISA (eBiosciences, San Diego, CA, USA). Cytokine arrays (RayBiotech, Inc., Norcross, GA, USA) were blotted using the manufacturer's instructions. For immunoblotting, proteins were resolved by SDS-PAGE and probed with anti-E-Cad (Cell Signaling, Danvers, MA, USA), anti-N-Cad (Abcam, San Francisco, CA, USA), anti-Vimentin (R&D Systems, Minneapolis, MN, USA), anti-TWIST1 (Abcam), anti-RELA (Santa Cruz Biotechnology Inc., Santa Cruz, CA, USA), anti-Myc (EMD, San Diego, CA, USA) and anti-β-actin (Sigma-Aldrich, St. Louis, MO, USA) antibodies. For immunoprecipitation, HEK293 cells were solubilized in RIPA buffer, the lysate centrifuged (10,000 × g, 10 minutes) and the supernatant containing the soluble proteins collected. Protein lysates (100 μg) were first pre-cleared with normal IgG and protein A/G plus conjugated agarose beads (Santa Cruz Biotechnology, Inc.), then incubated with new beads and antibodies of interest overnight (4°C, on a rocker). Beads were washed five times (RIPA buffer) and boiled in Laemmli loading buffer in the presence of Dithiothreitol for further analysis. BT549 cells collected for fractionation-coupled co-IP were first resuspended in KCl (10 mM) hypotonic buffer and lysed with 0.4% IGEPAL (NP-40 substitute); nuclei were collected by centrifugation and solubilized with high salt buffer (0.4 M NaCl) by rocking (4°C, 1 h). Nuclear lysates were cleared by centrifugation (16,000 × g, 5 minutes) and the salt concentration was adjusted to 135 mM for co-IP experiments. Total RNA was isolated with the RNeasy Mini Kit (Qiagen, Valencia, CA, USA). First strand cDNA was synthesized from 1 μg total RNA with the iScript cDNA synthesis kit (Bio-Rad, Hercules, CA, USA). PCR was performed for 35 cycles (95°C, 30 s; 57°C, 30 s; 72°C, 15 s) with Taq DNA polymerase (Invitrogen). Relative mRNA levels were quantified using SYBR supermix (Bio-Rad, Hercules, CA, USA) on an iCycler iQ5 for 40 cycles (95°C, 30 s; 57°C, 15 s; 72°C, 15 s) followed by default melting curve cycles and analyzed using IQ5 software by PCR baseline subtraction (Bio-Rad). The following primers were used: TWIST1 forward 5'-AGCAAGATTCAGACCCTCAAGC-3', reverse 5'-CTCCATCCTCCAGACCGAGA-3'; IL8 forward 5'-CTGTCTGGACCCCAAGGAAAACT-3', reverse 5'-GCAACCCTACAACAGACCCACAC-3'; β-ACTIN forward: 5'-CCGCAAAGACCTGTACGCCAAC-3', reverse 5'-CCAGGGCAGTGATCTCCTTCTG-3'. The human IL8 promoter (bases -262 to -55) was amplified from MCF10A genomic DNA (DNeasy® tissue kit, Qiagen) and cloned into pGL3 plasmid. pGL3-IL8 ΔκB and ΔE-box were generated by PCR site-directed mutagenesis (SDT). The coding sequences of TWIST1 full length and truncated (missing the last 20 amino acids, ΔWR) were amplified from pcDNA3-Tw  and subcloned into pcDNA4. SDT were induced to generate the C432A A433G mutations (S144R K145E) and C352T mutation (R118C). WT pcDNA4-TWIST1 was subcloned into pENTR4 (Invitrogen) to shuttle into pAd/CMV/V5-DEST (Invitrogen) by LR clonase II (Invitrogen). Adenoviral particles were packaged using HEK293A cells, according to the manufacturer's guidelines, and titrated. The mRNA target sequences of shRNAs shTw1 (shTw) and shTw2 were 5'-GGACAAGCUGAGCAAGAUU-3' and 5'-GCGACGAGCUGGACTCCAA-3', respectively. The sequences of shCtrl (mRNA target sequence UUCUCCGAACGUGUCACGU) and shIL8 (mRNA target sequence GCCAAGGAGUGCUAAAGAA) were previously reported . shRNAs were created with siRNA sequences connected to a loop and a complementary sequence that were cloned into pcDNA3-U6 (gift from Dr. John Rossi, Beckman Research Institute of City of Hope). The U6-shRNA fragments were subcloned into pENTR4 (Invitrogen) to shuttle into pLenti6/Block-It™-DEST (Invitrogen). Lentiviral particles were generated, according to the manufacturer's guidelines, using HEK293FT cells. pGL3-3X κB, pCMV-IκBSR, pPCR-shGFP and pPCR-shRelA plasmids were gifts from Dr. Rama Natarajan (Beckman Research Institute of City of Hope). Cells were seeded in 24-well plates and co-transfected with pGL3 firefly luciferase promoter construct, pSV40-Renilla luciferase (Promega, San Luis Obispo, CA, USA) and transcription factor constructs of interest. After transfection (24 h), cell lysates were collected and firefly/renilla luciferase activities were assayed for luminescence using the Dual-Luciferase Reporter Assay System (Promega). ChIP assays were performed using the fast ChIP protocol  with minor modifications as follows. Cells were cross-linked on a dish with 1.1% formaldehyde (10 minutes, room temperature), quenched with 1.25 M glycine solution (5 minutes, room temperature), and collected in 1 ml PBS with protease inhibitors cocktail (Roche Applied Science Indianapolis, IN, USA)). Cells were then processed and IPs performed as described . Precipitated chromatin was quantified using quantitative PCR and presented as percent of input. Anti-TWIST1 antibodies used for ChIP were custom-made to target the sequence GCQPPSGKRGGRKRRTSRRT. Anti-RELA antibodies were from Santa Cruz Biotechnology, Inc.; normal rabbit IgG was from Millipore (Temecula, CA, USA). Enrichment of IL8 promoter was analyzed by qPCR and presented by percent input using primers forward 5'-GTGATGACTCAGGTTTGCCC-3' and reverse 5'-GGTTGGTTTCTTCCTGGCTCT-3'. Control primers, forward 5'-ATCAGTCAAGCCAGGTTGTGTC-3', reverse 5'-AACACAGTGCATGGAGTGACAA-3', target a region 2 kb upstream of the transcription initiation site for the IL8 gene. Transwell inserts (Millipore, 8 μm pore diameter) were pre-coated with 1 mg/ml fibronectin and equilibrated with serum free medium in a TC incubator for 1 h Cells (3.75 × 105 for MCF10A and MCF10ATw cells, 1 × 105 for BT549 cells) were resuspended in culture medium supplemented with 0.25% serum (400 μl) and loaded onto the upper well of inserts. Media (600 μl) that contained 20% serum and indicated components of interest were added to the lower well. For invasion assays, Matrigel (60 μl, 3 mg/ml, diluted with serum-free medium, BD Biosciences San Jose, California, USA) was layered on the upper membrane and placed in the TC incubator for 30 minutes to solidify. Cells were allowed to migrate/invade for 24 h, followed by fixation with 4% paraformaldehye and staining with hematoxilin and eosin. Transwell membranes were removed and cells on the upper side cleaned off with a cotton tip. Membranes were then mounted and images taken of the upper, lower, left, right and center of the membrane. Migrated or invaded cells were quantified using Image-ProPlus5.1 (Media Cybernetics, Inc. Rockville, MD 20850 USA). and data presented as a sum of the five images. Neutralizing anti-IL8 antibodies were purchased from R&D Systems; IL8 inhibitors repertaxin and SB225002 were from Sigma. Cells (3.75 × 104 for MCF10A and MCF10ATw cells; 104 for BT549 cells) were seeded in 96-well plates in equivalent conditions as for migration/invasion assays, and cell counts were determined with CellTiter 96 Aqueous One solution (Promega) according to the manufacturer's guidelines. Conditioned media collected from MCF10A and MCF0ATw cells were filtered through a PVDF 0.45 μm low protein binding filter, concentrated using a 3000 NMWL Centricon concentrator (Millipore), mixed with β-mercaptoethanol-free loading buffer and resolved on a non-reducing PAGE gel that contained 0.1% (1 mg/ml) gelatin (Sigma). The gel was then incubated (1 h, room temperature, with shaking) in 2.5% Triton-X100 solution in water, followed by incubation (overnight, 37°C) in digestion buffer (10 mM calcium chloride, 20 mM Tris Acetic Acid, pH of 7.5). The gelatin gel was then stained with Coomassie Brilliant Blue (Bio-Rad) for 30 minutes at room temperature, washed with destaining solution (50:10:40 methanol:acetic acid:water) and imaged using a Kodak Electrophoresis Documentation and Analysis System 290 Eastman Kodak Company, Molecular Imaging Systems, New York, USA. STOCKHOLM (GSE1456) and UPPSALA (GSE3494) microarray data sets were downloaded from the NCBI Gene Expression Omnibus. The data were divided into subtypes  based on information provided by Dr. Yudi Pawitan (Karolinska Institut, Sweden) and relative expression levels were represented by raw data. Non-parametric Mann-Whitney U test was performed to calculate the P-values presented. This project was supported by grant number R21 CA107245 to CAG and grant number P30 CA033572 from the National Cancer Institute. Its contents are solely the responsibility of the authors and do not necessarily represent the official views of the National Cancer Institute or NIH. Additional support was provided by the Rosalind and Arthur Gilbert Foundation, the Jewish Federation of Los Angeles, the Pacific Northwest Foundation and the AVON Breast Cancer Foundation. We thank Drs. Guihua Sun and Lisa Scherer from Dr. John Rossi's laboratory (City of Hope, Beckman Research Institute) for their help in the design of shRNA against TWIST1 and providing the pcDNA3-U6 plasmid vector used in this study. We also thank Dr. Yudi Pawitan (Karolinska Institutet, Sweden) for providing information on the human breast tumor datasets; Dr. Rama Natarajan and her group (City of Hope, Beckman Research Institute) for helpful discussions and technical support; and Dr. Keely Walker (City of Hope, Beckman Research Institute) for her critical and thorough editorial review during the preparation of this manuscript. SL carried out the molecular and cellular studies, participated in the experimental design and data analysis, and drafted the manuscript. SEK conceived of the study and carried out the cytokine array immunoblots. RR participated in the ChIP assays. JF carried out part of the ChIP assays. MC carried out the microarray study. ZL carried out the GSEA analysis and participated in the statistical analysis. GL participated in the qPCR and luciferase reporter assays. YHL, YHT, VL and SD participated in plasmid construction. SF participated in the microarray study and analysis. KSA participated in the initial design and coordination of this study and reviewed the manuscript. CG participated in conceiving of the study, its design and coordination, and helped to draft the manuscript. All authors read and approved the final manuscript.